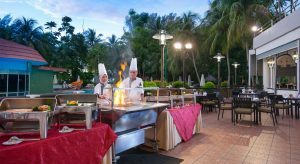 An impressive choice of restaurants and bars awaits at our Batu Ferringhi resort. Dine in shorts and sandals by the shimmering swimming pool, or dress up for a fine dining experience at Marco Polo restaurant. Under the stars, in the garden or in the old-world charm of our lobby lounge, our welcoming bars and dining destinations set the scene for memories that will be treasured long after you return home.